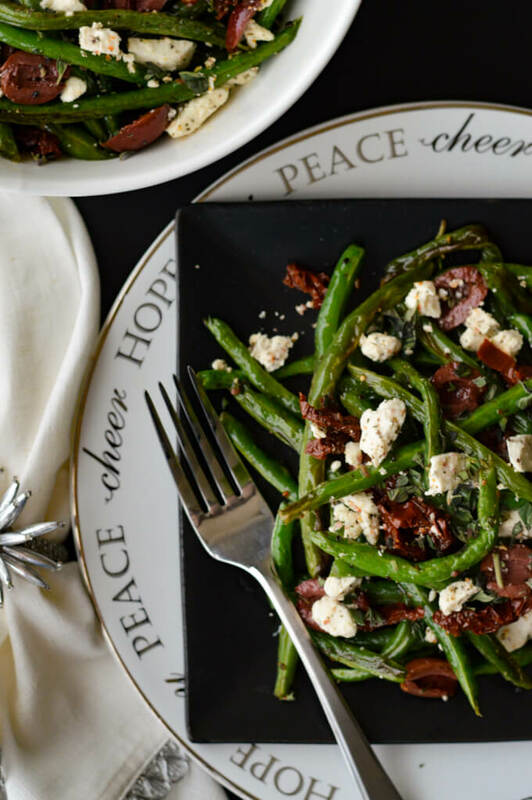 These fresh green beans are an easy but “elegant” side dish to any dinner party or holiday table. 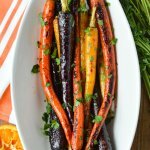 They are roasted to a perfect tenderness with flavors and textures layered throughout this dish. I grew up eating green beans that had simmered in a liquid with the grease of a pound of fried bacon. Then a stick of melted butter added to the beans. And, of course, the crumbled bacon sprinkled on top. Ridiculous, but so dang good. That’s another story and another recipe. Right now, let’s talk about things that are a little more dignified. 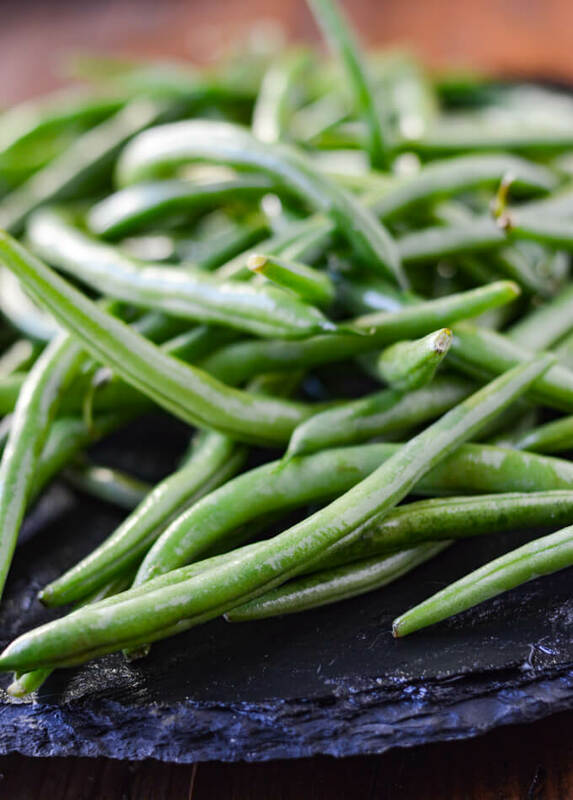 Green Beans – I wouldn’t necessarily call them an “elegant” side dish. But envision sprinkling feta cheese, sun-dried tomatoes, and kalamata olives to this dish, and just like that, they’re elevated to a “classy” restaurant status. This polished refinement is exactly what your holiday menu is looking for this season. Fresh Green Beans are used in this side dish. 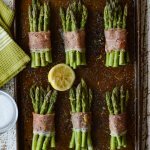 No canned green beans in this recipe. Fresh vegetables will always be a healthier choice first of all because of the vast nutrients they bring to the table. 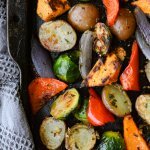 Secondly, the processing of canned or even in some cases frozen vegetables removes many of those wonderful nutrients that our bodies crave and need. 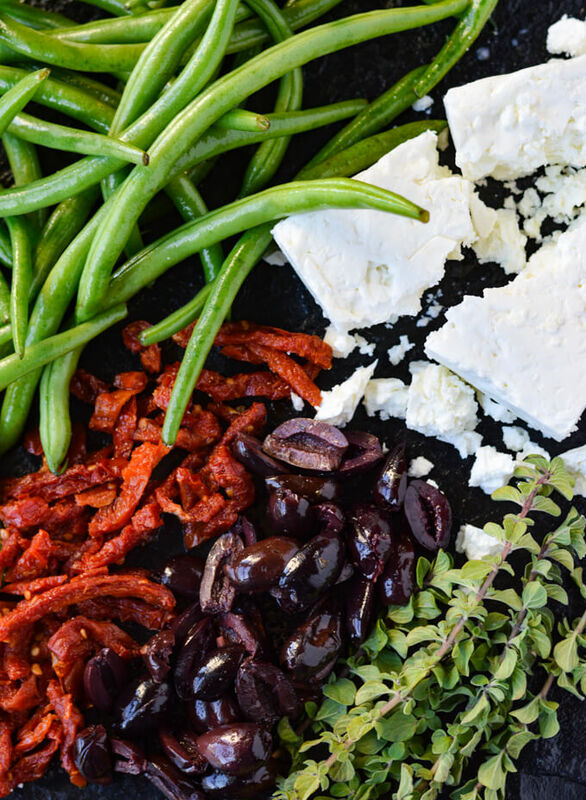 The sun-dried tomatoes, kalamata olives, and the feta cheese bring about a depth of not only flavor but of texture. 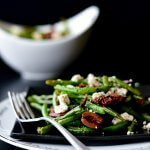 Most green bean recipes that I’ve had or made in past include some bacon or some onion or maybe a few sliced almonds. 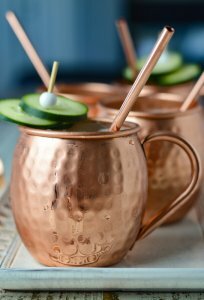 Nothing wrong with any of that but the ingredients in this recipe takes it to a new level of deliciousness. 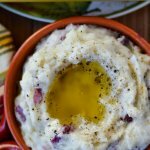 This recipe is super easy with very little prep needed. What could be easier than throwing a couple pans of green beans in the oven to roast? Then toss in the rest of the ingredients that involved little effort or time. Now that’s what I call simple. 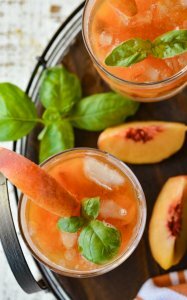 (I, first of all, came across this recipe in the Sonoma diet Cookbook about 10 years back and have tried many variations, but always come back to this version. Choosing and storing fresh green beans. Fresh is always the best and healthiest option. Be sure and choose green beans that are bright green and free from spots and/or blemishes. Pick beans that are nice and firm avoiding skinny, flimsy ones. Do not wash the beans until ready to cook otherwise the moisture could create mold. If storing for later use, place a paper towel in a ziplock bag, add the green beans, push out as much air as you can and seal it. Store the bag in the vegetable crisper drawer of your refrigerator for up to a week. The added ingredients are what makes this recipe so delicious. 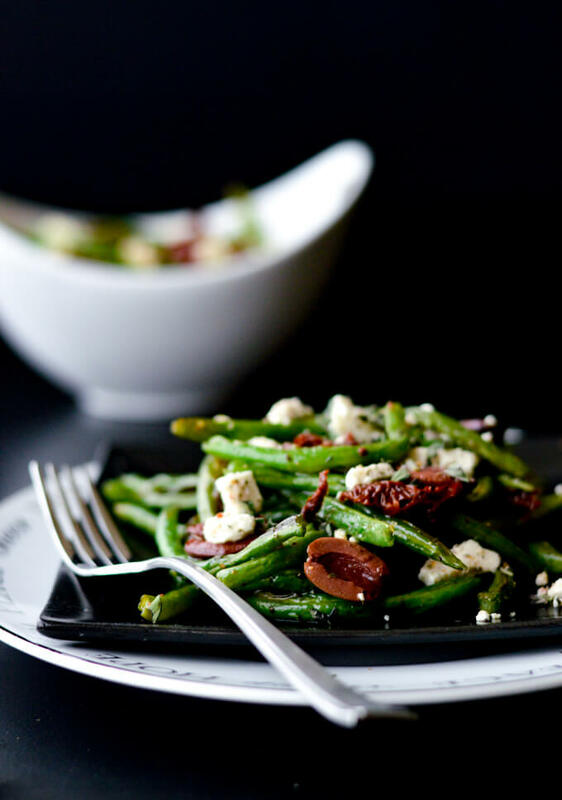 Between the sweet sun-dried tomatoes, the salty, briny kalamata olives, the tangy feta cheese, and the fresh oregano, these ingredients complement the roasted green beans so perfectly. Make sure and choose the julienne cut tomatoes in olive oil. Since they’re already cut for you, it makes prep so much easier. I pick the olives from the olive bins in the produce department because they tend to be tastier. And I’ll always choose fresh instead of jars or cans if I have the choice. And speaking of fresh, I like to use fresh herbs most of the time, especially if I’m finishing a dish like these green beans. Preparing the beans for roasting. Snap the ends of the beans off and if the beans are really long snap them in two. Place them in a large bowl and drizzle the olive oil over them, sprinkle salt and pepper to taste and toss all of this together in the bowl. 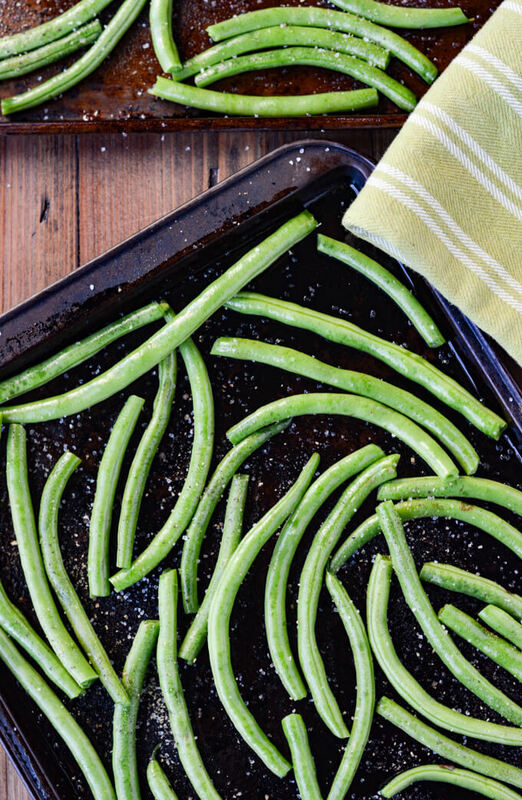 Spread the green beans in a single layer on two large cookie sheets. Make sure and give some room between the beans otherwise they will steam instead of roast. Place the pans in a preheated 425°F oven and roast for 15-minutes. Flip the beans over with a large spatula and return to the oven until they are brown in spots and slightly wrinkled. This will take another 10-15 minutes. Remove the pan from the oven and place the beans in a large bowl for combining everything. Add the feta cheese, drained sun-dried tomatoes, and the kalamata olives. Squeeze the juice of a medium size lemon, sprinkle on the chopped oregano and toss it all together. And now you’re ready to serve this bowl of “haricot’ delight. 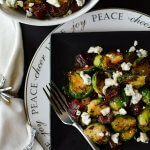 See how beautiful and festive this dish is! And, oh the color. You have the greens of the beans, the red of the tomatoes, the deep purple of the kalamata olives, and the white of the feta cheese. So lovely, so delicious and so simply “elegant” for your Thanksgiving or Christmas Table. Preheat oven to 425° F. Line two baking sheets with foil. In a large bowl, drizzle the olive oil over the green beans and sprinkle with salt and pepper. Gently toss to coat. Divide the green beans between the two baking sheets. Spread the beans in an even layer and roast for 15 minutes. Flip the beans with a large spatula and return the pans to the oven. Roast another 10-15 minutes until the beans become slightly wrinkled and are brown in spots. 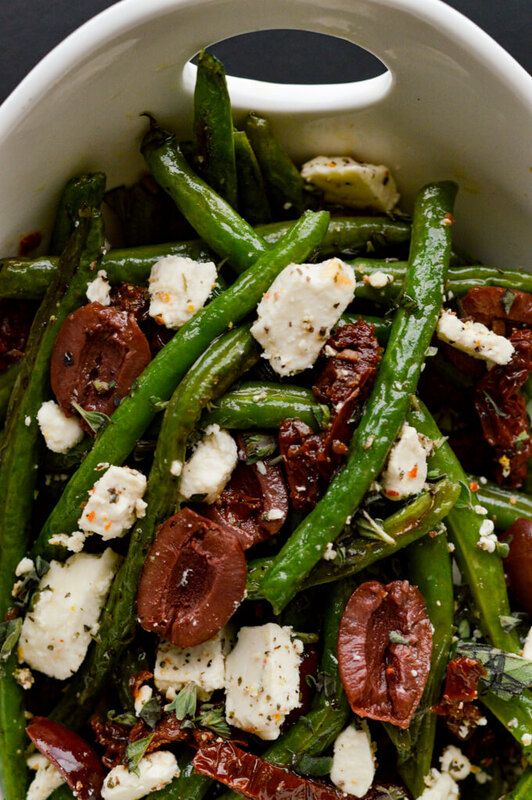 Combine beans, feta cheese, sun-dried tomatoes, olives, lemon juice and oregano. Serve immediately. Fresh is always the best and healthiest option for vegetables. Be sure and choose the beans that are bright green and free from spots and or blemishes. Avoid skinny, flimsy beans and pick those that are nice and firm. Do not wash the beans until ready to cook otherwise the moisture could create mold. Place a paper towel in a ziplock bag, add the green beans, push out as much air as you can and seat it. Store the bag in the vegetable crisper drawer of your refrigerator for up to a week. Choose the julienne cut sun-dried tomatoes in olive oil. Since they’re already cut for you, it makes prep so much easier. Snap the ends of the beans off and if the beans are really long snap them in two. Spread the green beans in a single layer on two large cookie sheets. If they’re too close together or one bean on top of another they will steam instead of roast. Thanks so much Carrie! I love green beans in any fashion, but this is probably my favorite recipe for them. 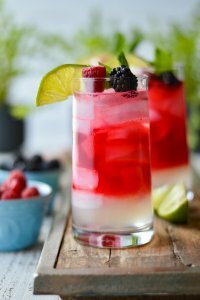 If you try them, I would love to know what you think!